March 2016 saw GMS gain WRAS Approval for a range of Plate Heat Exchangers. The WGC09 range of plate heat exchangers (for units with 44 - 94 plates) has been found to comply with the requirements of the United Kingdom Water Supply (Water Fittings) Regulations and Scottish Water Byelaws. 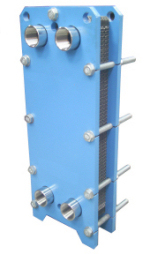 The heat exchanger is suitable for a maximum working pressure of 14.3 Bar and a maximum operating temperature of 99˚C. This is a major step for GMS in terms of product development, and we are already looking to extend our range of WRAS approved heat exchangers with units currently out for testing. Update: The WRAS Approved range has been extended to include WGC09 units with 10 - 94 plates. Please contact our technical department for more information on our range of WRAS approved heat exchangers. Alternatively, check out our product page or contact our sales department for a quotation.